Evidence against a man accused of killing four people at the Brussels Jewish Museum has been given by two French Journalists. These journalists were held by the Islamic State Militants in Syria. The attack at the Brussels Jewish Museum happened in May 2014. One of the Journalist, Nicolas Hénin said that he has no doubt that Mehdi Nemmouche was his jailer and torturer in Syria. He added that he knew him as Abou Omar. An ex-captive, Didier François agreed to this. Mehdi, the 33-year-old defendant, denies that carried out the attack at the Jewish Museum. Also, he allegedly travelled to Syria in January 2013 and faces a separate trial in France for his alleged role as an Islamic State jailer. The trial of Mehdi began last month, but it was heard for the first time on Thursday from Nicolas Hénin and Didier François. These persons were held by IS militants in a hospital in Aleppo in June 2013 and freed in April 2014, only a month before the Jewish Museum attack. Of the 23 foreign hostages held by the ISIS, eight were in Aleppo. François told the court that their captors were part of a structure and were involved in organizing the Paris and Brussels bombings in November 2015 and March 2016. He said Paris bomb-maker and Brussels airport suicide bomber Najim Laachraoui was one of the guards. Mr Hénin told the court that Mehdi Nemmouche was sadistic because he was full of hatred – “an anti-Semitic hatred”. 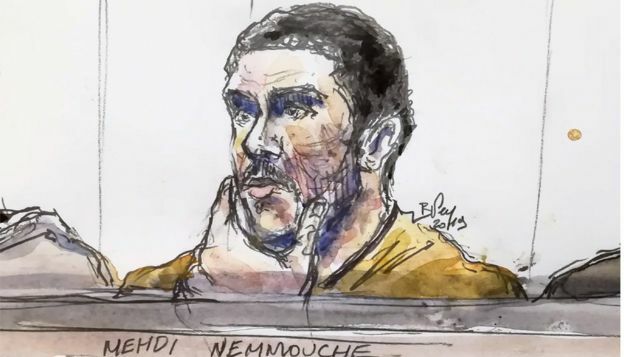 He said Nemmouche admired the Toulouse jihadist killer Mohamed Merah and loathed Shia Muslims. Asked by the federal prosecutor if he had ever met the two journalists, the defendant refused to answer. The trial continues. On 24 May 2014, a lone gunman entered the lobby of the Jewish Museum in Brussels. He opened fire on those inside and fled within a couple of minutes. Four people died in the attack in the Sablon area of the city. They were Emmanuel Riva (54), Myriam Riva, (53) (from Tel Aviv, Israel), Dominique Sabrier, (66) (French volunteer at the museum) and Alexandre Strens (25) (worked at museum’s reception). Six days earlier, French-born Medhi Nemmouche was arrested carrying two guns in Marseille in southern France. The investigative agencies must find out if Mehdi was indeed the person behind the Jewish Museum attack, where four innocent persons were killed. Also, because they have Mehdi in custody, he might be able to shed light on whether he was actually a jailer for the ISIS or not. If they are successful in finding that out, they would like to know if Najim Laachraouic was indeed one of the guards with him. Hénin’s claim that Mehdi was sadistic, anti-Semitic and admired Mohamed Merah and loathed Shia Muslims must be verified. If all this information is verified, then the true list of crimes committed by Mehdi can be uncovered. Moreover, it can be determined if the Mehdi and his comrades were involved in the planning and execution of Paris and Brussels bombings in November 2015 and March 2016. It is certain that using existing methods of interrogation and investigation are very time-consuming, cumbersome, and often unreliable. DNA and Fingerprinting as popular and fairly modern tools used in the investigation. Most genetic tests take 24-72 hours but the time taken for DNA to go from crime scene to identification can span as long as 14 days. By the time that the results are back, the suspects often have been released. To add to this, DNA and Fingerprints are uncovered in only 1 to 2 per cent of all cases. Brainwave Science is a Massachusetts based company which aims to make the process of intelligence gathering more efficient and reliable. Often, forensic tests are expensive, time-consuming and labour-intensive. There is often a shortage of workforce and a backlog of cases in investigative and law enforcement departments across the globe. The answer to this problem is Brainwave Science’s iCognative. A iCognative test takes around 45 minutes and involves no torture or coercion. The test subject is made to look at pictures, words or phrases (also called stimuli) related to a specific crime. At the same time, the test subject wears a headset which records and transmits the brain responses of the subject for every stimulus, to the iCognative computer. After the test has been concluded, the computer displays the result telling whether there is ‘information present’ or ‘information absent’ in the brain of the subject. The result comes with 99.9% accuracy and is reliable. It is fully automated and uses minimal equipment. Using this test the investigators can quickly screen suspects, and save time money and effort. We know DNA and fingerprints are uncovered in one to two per cent of the cases, but iCognative is a technology which Is applicable to 85-90% of all cases, whether they are civil or criminal. It is applicable to disciplines like national security, immigration, counterterrorism, law enforcement, border control, and human and drug trafficking. iCognative is non-invasive in nature. A test subject doesn’t exchange any words with the test administrator. The aim of iCognative is to eliminate human suffering and torture from the process of interrogation. For the test of Mehdi, the stimuli which can be used are the words ‘Abou Omar’ in a language he understands, details of the two French journalists i.e. Nicolas Hénin and Didier François, pictures and other details of the Jewish Museum which he allegedly attacked, the pictures of the victims, grabs from the CCTV footage of the attack, pictures and details of other guards like Najim Laachraouic, pictures of Toulouse jihadist killer Mohamed Merah, anti Shia Muslim propaganda material, anti-semitic propaganda material, etc. iCognative tests when run on such arrested persons can help identify potential threats, detect bomb-making/IED knowledge, help verify hierarchal and leadership structure within terrorist organizations, also swiftly detect potential threats within asylum applicants and refugee camps, and validate the possible links from database analysis techniques and methodologies. The Belgian authorities must try out iCognative to quickly detect crucial crime-related information in the brain of Mehdi. They must make use of the inbuilt database techniques to deconstruct terrorist organisations, get clues on other pending investigations.